Abd Al-Karim Qasim Muhammed Bakr Al-Fadhli Al-Zubaidi (Arabic: عبد الكريم قاسم‎ `Abd Al-Karīm Qāsim IPA: [ʕabdulkariːm qaːsɪm]) (21 November 1914 – 9 February 1963) was an Iraqi Army brigadier and nationalist who seized power when the Iraqi monarchy was overthrown during the 14 July Revolution. He ruled the country as the 24th Prime Minister until his downfall and death during the 1963 Ramadan Revolution. During his rule, Qasim was popularly known as al-za‘īm (الزعيم) or, "The Leader". 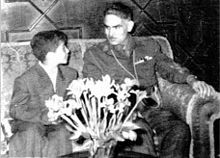 Abd al-Karim's father, Qasim Muhammed Bakr Al-Fadhli Al-Zubaidi was a farmer from southern Baghdad and an Iraqi Sunni Muslim who died during World War 1, shortly after his son's birth. Qasim's mother, Kayfia Hassan Yakub Al-Sakini was a Shiite Muslim from Baghdad. When Qasim was six his family moved to Suwayra, a small town near the Tigris, then to Baghdad in 1926. Qasim was an excellent student and entered secondary school on a government scholarship. After graduation in 1931, he taught at Shamiyya Elementary School from 22 October until 3 September 1932, when he was accepted into Military College. In 1934, he graduated as a second lieutenant. Qasim then attended al-Arkan (Iraqi Staff) College and graduated with honours (grade A) in December 1941. In 1951, he completed a senior officers’ course in Devizes, Wiltshire. Although shy and lacking in "the rabble-rousing skills on which most successful Arab politicians rely", he was nonetheless nicknamed "the snake charmer" by his classmates in Devizes, because of his gift in convincing them to undertake improbable courses of action during military exercises. Militarily, he participated in the suppression of the tribal disturbances in the Middle Euphrates region in 1935, during the Anglo-Iraqi War in May 1941 and in the Kurdistan War in 1945. 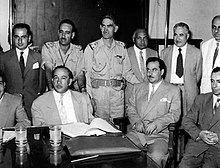 Qasim also served during the Iraqi military involvement in the Arab-Israeli War from May 1948 to June 1949. Toward the latter part of the mission, he commanded a battalion of the First Brigade, which was situated in the Kafr Qasem area south of Qilqilya. In 1956–57, he served with his brigade at Mafraq in Jordan in the wake of the Suez Crisis. By 1957 Qasim had assumed leadership of several opposition groups that had formed in the army. Qasim (back row, left of centre) and other leaders of the revolution, including Abdul Salam Arif (back row, second from left) and Muhammad Najib ar-Ruba'i (back row, fifth from left). Also included is Ba'athist ideologue Michel Aflaq (front row, first from right). On 14 July 1958, Qasim and his followers used troop movements planned by the government as an opportunity to seize military control of Baghdad and overthrow the monarchy. This resulted in the killing of several members of the royal family and their close associates, including Nuri as-Said. The coup was discussed and planned by the Free Officers and Civilians Movement, but was mainly executed by Qasim and Col. Abdul Salam Arif. It was triggered when King Hussein of Jordan, fearing that an anti-Western revolt in Lebanon might spread to Jordan, requested Iraqi assistance. Instead of moving towards Jordan, however, Colonel Arif led a battalion into Baghdad and immediately proclaimed a new republic and the end of the old regime. Put in its historical context, the 14 July Revolution was the culmination of a series of uprisings and coup attempts that began with the 1936 Bakr Sidqi coup and included the 1941 Rashid Ali military movement, the 1948 Wathbah Uprising, and the 1952 and 1956 protests. The 14 July Revolution met with virtually no opposition. Prince Abdul Ilah wanted no resistance to the forces that besieged the Royal Rihab Palace, hoping to gain permission to leave the country. The commander of the Royal Guards battalion on duty, Col. Taha Bamirni, ordered the palace guards to cease fire. On 14 July 1958, the royal family including King Faisal II; the Prince 'Abd al-Ilah; Princess Hiyam, Abdullah's wife; Princess Nafisah, Abdullah's mother, Princess Abadiyah, the king's aunt, and several servants were attacked as they were leaving the palace. When all of them arrived in the courtyard they were told to turn towards the palace wall. All were then shot by Captain Abdus Sattar As Sab’, a member of the coup led by Brigadier Abd al-Karim Qasim. King Faisal II and Princess Hiyam were wounded. The King died later before reaching hospital. Princess Hiyam was not recognized at the hospital and managed to receive treatment. Later she left for Saudi Arabia where her family lived. She later moved to Egypt and lived there until her death. In the wake of the successful coup, the new Iraqi Republic was headed by a Revolutionary Council. At its head was a three-man sovereignty council, composed of members of Iraq's three main communal/ethnic groups. Muhammad Mahdi Kubbah represented the Shi’a population; Khalid al-Naqshabandi the Kurds; and Najib al Rubay’i the Sunni population. This tripartite was to assume the role of the Presidency. A cabinet was created, composed of a broad spectrum of Iraqi political movements: this included two National Democratic Party representatives, one member of al-Istiqlal, one Ba’ath representative and one Marxist. After seizing power, Qasim assumed the post of Prime Minister and Defence Minister, while Colonel Arif was selected as Deputy Prime Minister and Interior Minister. They became the highest authority in Iraq with both executive and legislative powers. Muhammad Najib ar-Ruba'i became chairman of the Sovereignty Council (head of state), but his power was very limited. On July 26, 1958, the Interim Constitution was adopted, pending a permanent law to be promulgated after a free referendum. According to the document, Iraq was to be a republic and a part of the Arab nation whilst the official state religion was listed as Islam. Powers of legislation were vested in the Council of Ministers, with the approval of the Sovereignty Council, whilst executive function was also vested in the Council of Ministers. The constitution proclaimed the equality of all Iraqi citizens under the law and granting them freedom without regard to race, nationality, language or religion. The government freed political prisoners and granted amnesty to the Kurds who participated in the 1943 to 1945 Kurdish uprisings. The exiled Kurds returned home and were welcomed by the republican regime. Qasim with future president of Iraqi Kurdistan, Massoud Barzani. Qasim assumed office after being elected as Prime Minister briefly after the coup in July 1958. He held this position until he was overthrown in February 1963. Despite the encouraging tones of the temporary constitution, the new government descended into an autocracy with Qasim at its head. The genesis of Qasim's elevation to "Sole Leader" began with a schism between himself and his fellow conspirator Arif. Despite one of the major goals of the revolution being to join the pan-Arabism movement and practice qawmiyah policies, Qasim soon modified his views, once in power. Qasim, reluctant to tie himself too closely to Nasser's Egypt- and sided with various groups within Iraq (notably the social democrats) that told him such an action would be dangerous- instead found himself echoing the views of his predecessor, Said, by adopting a wataniyah policy of "Iraq First". 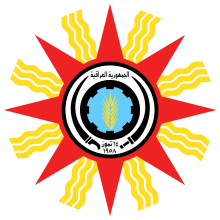 The Iraqi state emblem under Qasim was mostly based on the sun disk symbol of Shamash, and carefully avoided pan-Arab symbolism by incorporating elements of Socialist heraldry. Unlike the bulk of military officers, Qasim did not come from the Arab Sunni north-western towns nor did he share their enthusiasm for pan-Arabism: he was of mixed Sunni-Shia parentage from south-eastern Iraq. Qasim's ability to remain in power depended, therefore, on a skillful balancing of the communists and the pan-Arabists. For most of his tenure, Qasim sought to balance the growing pan-Arab trend in the military. Qasim lifted a ban on the Iraqi Communist Party, and demanded the annexation of Kuwait. He was also involved in the 1958 Agrarian Reform, modelled after the Egyptian experiment of 1952. Qasim is said by his admirers to have worked to improve the position of ordinary people in Iraq, after the long period of self-interested rule by a small elite under the monarchy which had resulted in widespread social unrest. Qasim passed law No. 80 which seized 99% of Iraqi land from the British-owned Iraq Petroleum Company, and distributed farms to more of the population. This increased the size of the middle class. Qasim also oversaw the building of 35,000 residential units to house the poor and lower middle classes. 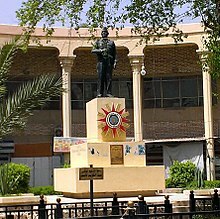 The most notable example, and indeed symbol, of this was the new suburb of Baghdad named Madinat al-Thawra (revolution city), renamed Saddam City under the Baath regime and now widely referred to as Sadr City. Qasim rewrote the constitution to encourage women's participation in society. Qasim tried to maintain the political balance by using the traditional opponents of pan-Arabs, the right wing and nationalists. Up until the war with the Kurdish factions in the north he was able to maintain the loyalty of the army. Despite a shared military background, the group of Free Officers that carried out the July 14 Revolution was plagued by internal dissension. Its members lacked both a coherent ideology and an effective organizational structure. Many of the more senior officers resented having to take orders from Arif, their junior in rank. A power struggle developed between Qasim and Arif over joining the Egyptian-Syrian union. Arif's pro-Nasserite sympathies were supported by the Baath Party, while Qasim found support for his anti-unification position in the ranks of the Iraqi Communist Party. Qasim's change of policy aggravated his relationship with Arif. The latter, despite being the subordinate of Qasim, had gained great prestige as the perpetrator of the coup itself. Arif capitalised upon his new found position by partaking in a series of widely publicised public orations, during which he strongly advocated union with the UAR, making numerous positive references to Nasser, while remain noticeably less full of praise for Qasim. Arif's criticism of Qasim became gradually more pronounced leading the latter to take steps to counter his potential rival. Qasim began to foster relations with the Iraqi Communist Party, who attempted to mobilise support in favour of his policies. He also moved to counter Arif's base of power by removing him from his position as deputy commander of the armed forces. On September 30 Qasim removed Arif's status as Deputy Prime Minister and as Minister of the Interior. Qasim attempted to remove Arif's disruptive influence by offering him a role as Iraqi ambassador to West Germany in Bonn. Arif refused, and in a confrontation with Qasim on October 11, Arif is reported to have drawn his pistol in the presence of Qasim; although whether it was to assassinate Qasim or commit suicide is a source of debate. No blood was shed, and Arif agreed to depart for Bonn. However his time in Germany was brief, as he attempted to return to Baghdad on November 4 amid rumours of an attempted coup against Qasim. He was promptly arrested, and charged on November 5 with attempted assassination of Qasim and attempts to overthrow the regime. He was brought to trial for treason and condemned to death in January 1959; but was subsequently pardoned in December 1962 and was sentenced to life imprisonment. Although the threat of Arif had been negated, another soon arose in the form of Rashid Ali, the exiled former Prime Minister who had fled Iraq in 1941. Ali attempted to foster support among officers who were unhappy at Qasim's policy reversals. A coup was planned for December 9, but Qasim was prepared, and instead had the conspirators arrested on the same date. Ali was imprisoned and sentenced to death, although the execution was never carried out. Relations with Iran and the West deteriorated significantly under Qasim's leadership, he actively opposed foreign troop presence in Iraq and spoke out against it. Relations with Iran were strained due to his call for Arab territory within Iran to be annexed to Iraq, and Iran continued to actively fund and facilitate Kurdish rebels in the North. Relations with the Pan-Arab Nasserist factions such as the Arab Struggle Party caused tensions with the UAR, and as a result the UAR began to aid rebellions in Iraqi Kurdistan against the government. The new Government declared Kurdistan “one of the two nations of Iraq.” During his rule, the Kurdish groups selected Mustafa Barzani to negotiate with the government, seeking an opportunity to declare independence. After a period of relative calm, the issue of Kurdish autonomy (self-rule or independence) went unfulfilled, sparking discontent and eventual rebellion among the Kurds in 1961. Kurdish separatists under the leadership of Mustafa Barzani chose to wage war against the Iraqi establishment. Although relations between Qasim and the Kurds had initially proved successful, relations had deteriorated by 1961, with the Kurds becoming openly critical of Qasim's regime. Barzani had delivered an ultimatum to Qasim in August 1961 demanding an end to authoritarian rule; recognition of Kurdish autonomy; and restoration of democratic liberties. Qasim's response was to negotiate with the Kurds and successfully restored relations between the Arabs and the Kurds. During Qasim's term, there was a much debate over whether Iraq should join the United Arab Republic, led by Gamal Abdel Nasser. Having dissolved the Arab Union with the Hashemite Kingdom of Jordan, Qasim refused to enter Iraq into the federation, although his government recognized the republic and considered joining it later. Qasim's growing ties with the communists served to provoke rebellion in the northern Iraqi city of Mosul led by Arab nationalists in charge of military units. 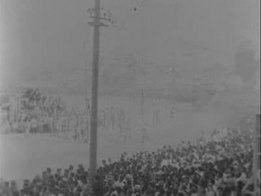 Qasim, in an attempt to mitigate against a potential coup had encouraged a communist backed Peace Partisans rally to be held in Mosul on 6 March 1959. Some 250,000 Peace Partisans and communists thronged through Mosul's streets on that date, and although the rally passed peacefully, on 7 March, skirmishes broke out between communists and nationalists. This degenerated into a major civil disturbance over the following days. Although the rebellion was crushed by the military, it had a number of adverse effects that impacted on Qasim's position. First, it increased the power of the communists. Second, it encouraged the ideas of the Ba’ath Party's (which had been steadily growing since the 14 July coup). The Ba’ath Party believed that the only way of halting the engulfing tide of communism was to assassinate Qasim. Of the 16 members of Qasim's cabinet, 12 were Ba'ath Party members. However, the party turned against Qasim due to his refusal to join Gamel Abdel Nasser's United Arab Republic. To strengthen his own position within the government, Qasim created an alliance with the Iraqi Communist Party, which was opposed to any notion of pan-Arabism. Later that year, the Ba'ath Party leadership put in place plans to assassinate Qasim. Saddam Hussein was a leading member of the operation. At the time, the Ba'ath Party was more of an ideological experiment than a strong anti-government fighting machine. The majority of its members were either educated professionals or students, and Saddam fitted in well with this group. The choice of Saddam was, according to journalist Con Coughlin, "hardly surprising". The idea of assassinating Qasim may have been Nasser's, and there is speculation that some of those who participated in the operation received training in Damascus, which was then part of the UAR. However, "no evidence has ever been produced to implicate Nasser directly in the plot." The assassins planned to ambush Qasim at Al-Rashid Street on 7 October 1959: one man was to kill those sitting at the back of the car, the rest killing those in front. During the ambush it was claimed that Saddam began shooting prematurely, which disrupted the whole operation. Qasim's chauffeur was killed, and Qasim was hit in the arm and shoulder. The assassins believed they had killed him and quickly retreated to their headquarters, but Qasim survived. The growing influence of communism was felt throughout 1959. A communist-sponsored purge of the armed forces was carried out in the wake of the Mosul revolt. The Iraqi cabinet began to shift towards the radical-left as several communist sympathisers gained posts in the cabinet. Iraq's foreign policy began to reflect this communist influence, as Qasim removed Iraq from the Baghdad Pact on 24 March, and later fostered closer ties with the USSR, including extensive economic agreements. However, communist successes encouraged attempts to expand on their position. The communists attempted to replicate their success at Mosul in Kirkuk. A rally was called for 14 July which was intended to intimidate conservative elements. Instead it resulted in widespread bloodshed. Qasim consequently cooled relations with the communists signalling a reduction (although by no means a cessation) of their influence in the Iraqi government. Qasim soon withdrew Iraq from the pro-Western Baghdad Pact and established friendly relations with the Soviet Union. Iraq also abolished its treaty of mutual security and bilateral relations with the UK. Also, Iraq withdrew from the agreement with the United States that was signed by the monarchy during 1954 and 1955 regarding military, arms, and equipment. On 30 May 1959, the last of the British soldiers and military officers departed the al-Habbāniyya base in Iraq. Qasim supported the Algerian and Palestinian struggles against France and Israel. "We do not wish to refer to the history of Arab tribes residing in Al-Ahwaz and Mohammareh (Khurramshahr). The Ottomans handed over Muhammareh, which was part of Iraqi territory, to Iran." After this, Iraq started supporting secessionist movements in Khuzestan, and even raised the issue of its territorial claims at a subsequent meeting of the Arab League, without any success. In June 1961, Qasim re-ignited the Iraqi claim over the state of Kuwait. On 19 June, Qasim announced in a press conference that Kuwait was a part of Iraq, and claimed its territory. Kuwait, however, had signed a recent defence treaty with the British, who came to her assistance with troops to stave off any attack on 1 July. This was subsequently replaced by an Arab force (assembled by the Arab League) in September, where they remained until 1962. The result of Qasim's foreign policy blunders was to further weaken his position. Iraq was isolated from the Arab world for its part in the Kuwait incident, whilst Iraq had antagonised its powerful neighbour, Iran. Western attitudes towards Qasim had also cooled, due to these incidents and his implied communist sympathies. Iraq was isolated internationally, and Qasim became increasingly isolated domestically, to his considerable detriment. In September 1960, Qasim demanded that the Anglo American-owned Iraq Petroleum Company (IPC) share 20% of the ownership and 55% of the profits with the Iraqi government. Then, in response to the IPC's rejection of this proposal, Qasim issued Public Law 80, which would have taken away 99.5% of the IPC's ownership and established an Iraqi national oil company to oversee the export of Iraqi oil. British and US officials and multinationals demanded that the Kennedy administration place pressure on the Qasim regime. The Government of Iraq, under Qasim, along with five petroleum-exporting nations met at a conference held 10–14 September 1960 in Baghdad, thereby creating OPEC. Qasim's position was fatally weakened by 1962. His overthrow took place the following year. The perpetrators were the Ba’ath Party. By 1962, the Ba’ath Party was on the rise as a new group of leaders under the tutelage of Ali Salih al-Sa’di began to re-invigorate the party. The Ba’ath Party was now able to plot Qasim's removal. Qasim was overthrown by the Ba'athist coup of February 8, 1963. While there have been persistent rumours that the Central Intelligence Agency (CIA) orchestrated the coup, declassified documents and the testimony of former CIA officers indicate there was no direct American involvement, although the CIA was actively seeking to find a suitable replacement for Qasim within the Iraqi military and had been informed of an earlier Ba'athist coup plot by a high-ranking informant within the Party. Despite evidence that the CIA had been closely tracking the Ba'ath Party's coup planning since "at least 1961," the CIA official working with Archie Roosevelt, Jr. on a separate plan to instigate a military coup against Qasim, and who later became the head of the CIA's operations in Iraq and Syria, has "denied any involvement in the Ba'ath Party's actions," stating instead that the CIA's efforts against Qasim were still in the planning stages at the time. Qasim was given a short trial and he was shot soon after. Later, footage of his execution was broadcast to prove he was dead. Between 1,500 and 5,000 Iraqis were killed in the fighting during 8–10 February 1963, and in the house-to-house hunt for "communists" that immediately followed. In July 2004, Qasim's body was discovered by a news team associated with Radio Dijlah in Baghdad. The 1958 Revolution can be considered to be a watershed in Iraqi politics, not just because of its obvious political implications (e.g. the abolition of monarchy, republicanism, and paving the way for Ba’athist rule) but also because of its domestic reforms. Despite its shortcomings, Qasim's rule helped to implement a number of positive domestic changes that benefited Iraqi society. The revolution brought about sweeping changes in the Iraqi agrarian sector. Reformers dismantled the old feudal structure of rural Iraq. For example, the 1933 "Law of Rights and Duties of Cultivators" and the Tribal Disputes Code were replaced, benefiting Iraq's peasant population and ensuring a fairer process of law. The Agrarian Reform Law (30 September 1958) attempted a large-scale redistribution of landholdings and placed ceilings on ground rents; the land was more evenly distributed among peasants who, due to the new rent laws, received around 55% to 70% of their crop. Despite the positive intentions of the Agrarian Reform Law, its implementation proved relatively unsuccessful due to disagreements between the lower classes and the landed middle classes, as well as a time consuming implementation process. Qasim attempted to bring about greater equality for women in Iraq. In December 1959 he promulgated a significant revision of the personal status code, particularly that regulating family relations. Polygamy was outlawed, and minimum ages for marriage were also set out, with 18 being the minimum age (except for special dispensation when it could be lowered by the court to 16). Women were also protected from arbitrary divorce. The most revolutionary reform was a provision in article 74 giving women equal rights in matters of inheritance. The laws applied to Sunni and Shi’a alike. The laws encountered much opposition and did not survive Qasim's government. Education was greatly expanded under the Qasim regime. The education budget was raised from approximately 13 million Dinars in 1958 to 24 million Dinars in 1960 and school enrolments increased. Attempts were also made in 1959 and 1961 to introduce economic planning to benefit social welfare; investing in housing, healthcare and education, whilst reforming the agrarian Iraqi economy along an industrial model. However, these changes were not truly implemented before Qasim's removal. Public Law 80 intended to take over 99.5% of the IPC's concession territory in Iraq and place it in the hands of the newly formed Iraq National Oil Company taking many of Iraq's oilfields out of foreign hands. ^ Supported by the National Democratic Party and Iraqi Communist Party. ^ Yapp, Malcolm (17 October 2014). The Near East Since the First World War: A History to 1995. Routledge. p. 84. ISBN 978-1-317-89054-6. ^ "Iraq - REPUBLICAN IRAQ". www.country-data.com. ^ "من ماهيات سيرة الزعيم عبد الكريم قاسم" (in Arabic). Am Mad as Supplements. 29 October 2014. ^ "The Dissembler". Time. April 13, 1959. ^ Tucker, Spencer C. (2014). Persian Gulf War Encyclopedia: A Political, Social, and Military History. ABC-Clio. p. 355. ISBN 978-1-61069-415-5. .
^ "Iraq - Land Tenure and Agrarian Reform". countrystudies.us. ^ "Iraq - REPUBLICAN IRAQ". countrystudies.us. ^ Kedourie, Elie; Politics in the Middle East, p. 318. ^ Farhang Rajaee, The Iran-Iraq War (University Press of Florida, 1993), pp. 111-112. ^ Karsh, Efraim, The Iran-Iraq War: 1980–1988, London: Osprey, 2002, p. 7. ^ Little, Douglas. American Orientalism: The United States and the Middle East Since 1945. The University of North Carolina Press. p. 62. ^ Styan, David. France and Iraq: Oil, Arms and French Policy Making in the Middle East. I.B. Tauris, 2006. p. 74. Dawisha, Adeed (2009). Iraq: a Political History from Independence to Occupation. Princeton University Press. ISBN 978-0-691-13957-9. Marr, Phebe (2004). The Modern History of Iraq. Westview Press. ISBN 9780813336152. Polk, William Roe (2005). Understanding Iraq. I. B. Tauris. ISBN 9780857717641. Simons, Geoff (1996). Iraq: From Sumer to Saddam. St. Martin's Press. ISBN 9780312160524. Wikimedia Commons has media related to Abd al-Karim Qasim. Qasim, Abd al-Karim (1959). Principles of 14th July revolution; a few collections of the epoch-making speeches delivered on some auspicious and historical occasions after the blessed, peaceful and miraculous revolution of July 14, 1958, Baghdad; Times Press.